Before we get started, I want to be completely honest with you: I did not start out intending to do the kitchen update ourselves. While I'm fairly confident in my DIY skills, my experience is mostly in furniture restoration and other smaller, less permanent projects. Because the kitchen is such a huge focal point in our open-concept home (and very much a permanent fixture), I was willing - and even planning - to have it done professionally. We made an appointment and had a local company come out to give us an estimate, and the experience left A LOT to be desired. The guy spent the entire meeting trying to sell me things I didn't want or need, and when I finally got the estimate from him (4 days later), there was no explanation of the work it would cover. Just a number. A very large number. And I'd done my research, so I had a general idea of what the professional updates I wanted would cost. 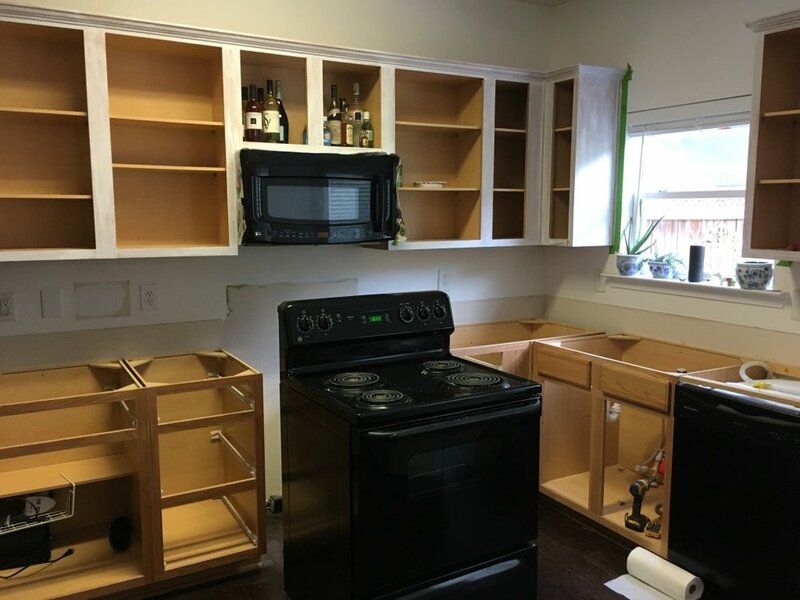 But $17,000 for a kitchen the size of ours? HA! So, I decided to do it myself. Instead of $17,000, we put in a lot of work and spent just $2,125! (And only $2,900 with upgraded appliances!) A tiny fraction of the price and I got every single thing I wanted. 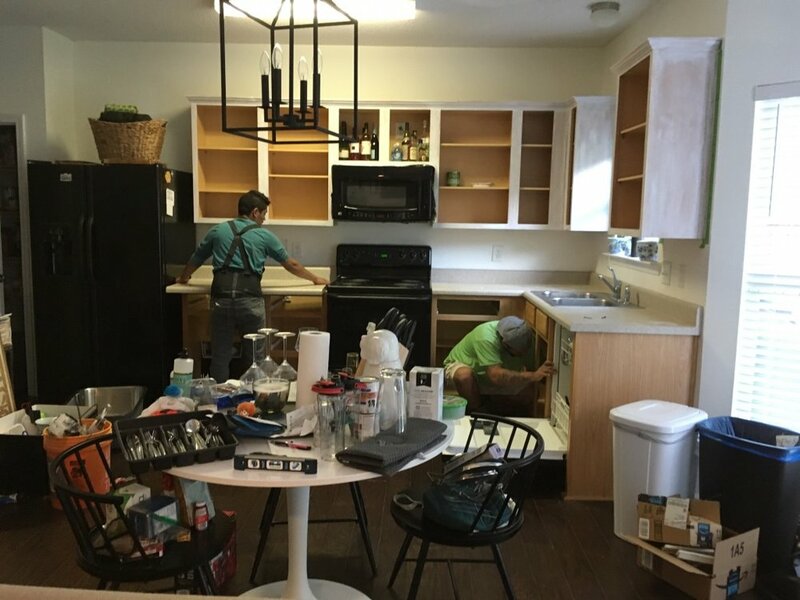 When it was all said and done, we had replaced the countertops, installed a new sink and faucet, painted the cabinets, replaced all the hardware, put up a new backsplash, and replaced the stove and microwave. It took us roughly two weeks, but that included a few days of wait time for the appliances and a few days that we were out of town for a wedding and busy with other things. If we had nothing going on and had planned a project timeline in advance, we probably could have done it all in a week. But why rush? Who needs a functioning kitchen and working plumbing when there's Chinese takeout to be had? If you're looking to do some kitchen updates of your own, or if you're just curious about the process, I've broken each project down below and included the online tutorials I used, a few of my own tips, lots of messy renovation iPhone pics, and a list of materials needed for each project. Here we go! I knew I wanted to have the old ones removed before painting to avoid any damage to the paint job. I also knew that our granite slab would be a focal point, and would influence our choices for the rest of the kitchen. We found our granite company by complete accident, after following Google Maps to not one, but TWO, non-existent granite companies. Two annoyed homeowners and one wrong turn later, we stumbled across Royal Granite, and pulled in to take a look. We walked in with no appointment, no firm idea on what we wanted, and a rough sketch of our kitchen (thank GOD I'd thought to bring some measurements with me), and they took the best care of us. Albert, the manager there, immediately sat us down, discussed our plans, and then took us outside to see some slabs. He was incredibly helpful, never tried to sell us anything but what we told him we were looking for, and even offered to let us do our own removal to save a little money (which we opted out of, and it was the best $80 I ever spent). We ended up picking a couple remnant slabs that fit our small kitchen perfectly and saved us a little money! We knew we'd be ditching our sink for an under-mount one, and decided to go with a single basin sink for better versatility (think large pots & baking sheets). We picked out this single-hole faucet, and I LOVE its pull-down nozzle and flat-spray feature. And, my handy husband saved us even more money buy reconnecting the sink/garbage disposal and installing the new faucet himself! 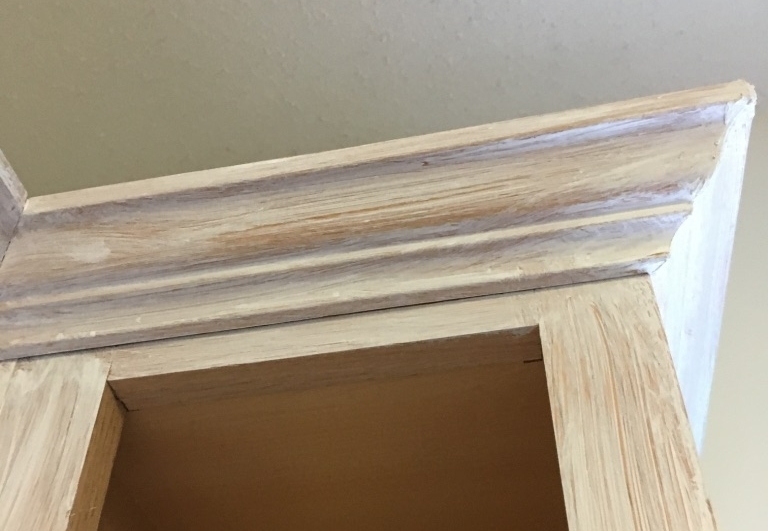 In the weeks before we started work on the kitchen, before touching anything, I read every article I could find online about painting kitchen cabinets, especially ones about oak cabinets in particular. My top three DIY posts (which I kept pulled up on my laptop to reference throughout the painting process) are by Practically Spoiled, Lauren McBride, and Little Dekonings. This post from This Old House is also a good one. While painting the cabinet boxes had to wait until after the new countertops were installed, there was a lot I could get started on right away. I removed the old knobs and put wood filler in the holes. Then, I used painter's tape to number each cabinet door and drawer, to make sure I could put it all back together properly. I then got out some ziplock bags and labeled them to match the doors, and got to work dismantling! Each door's hinges went into the matching ziplock bag, which I stashed off to the side for later. I set up a work area in the garage and moved all the doors and drawers out there. I cleaned each one, scraped off the old bumpers, sanded, deglossed, and then laid them on a drop cloth on top of their label. Instead of buying painter's triangles, I took the money-saving route and used canned food covered in dish towels. The cans lifted the cabinet doors of the floor so I could paint the edges, and the towels kept the cans from leaving marks on the dried paint job. Starting with the back sides, each piece got two coats of primer (front and back), three coats of paint, and three coats of sealer. We used leftover paint from when we moved in, and since we were saving so much by doing the painting myself, I felt better about getting a more expensive sealer. I went with this recommendation from one of the tutorials I read; it has great reviews and since these cabinets get a lot of use, I felt it was worth the extra price for extra protection. Back inside, I emptied the contents of our cabinets into the living room. After the countertops were removed and replaced, I covered them with paper to protect from drips and got to work on the boxes. The cabinets then got another coat of primer, three coats of paint, and three coats of sealer. After drying for a day or so, I reassembled! The final (and arguably most important) step was to add new bumpers to all the doors and drawers. Gotta protect all that hard work! This was the first look at our vision coming together, and we were thrilled. SO satisfying. Goodbye forever, orange oak! At this point, the holes from the previous hardware have been filled and painted over, so all we have to worry about is drilling new holes for the new hardware. Easy, right? Wrong. I briefly considered leaving the cabinet doors without hardware, mostly out of hesitance to drill holes in my freshly (and painstakingly) painted cabinets, but 1- I felt leaving them bare made the cabinets look a little unfinished, and 2- I thought having handles to grasp instead of touching the cabinets themselves when opening a door would protect and prolong the life of the paint job. First, we had to pick out hardware. That part actually WAS easy; I'd had my eye on this style bar pull for a while. They're a little modern and a little classic, which wouldn't clash with the style of the cabinet doors (and those were NOT being replaced, because $$$). I'm sure I could have saved a few more dollars by getting pulls somewhere online like Build.com, but I was in an instant-gratification mood and Home Depot had them in stock :) Plus, I wanted to bring home a couple different sizes to see what I liked best before committing to buying all 16 of them. Before installing, I determined the placement I wanted, a combination of this and this, and made some cardboard templates. If we ever do this again, I'd opt for a more sturdy wooden rig, something like this that holds itself in place. Now, this step in the process is where we first encountered what I consider to be a true renovation moment. You know, like the ones you see on HGTV when the couples are working together, and then something goes wrong, and the wife's voice starts to get louder and more shrill, and the husband is trying to argue that the mistake isn't a big deal, but it IS A BIG DEAL, JOHN, IT'S A HUGE DEAL AND EVERYTHING IS RUINED AND MAYBE THIS WAS ALL A MISTAKE. Thankfully for us, our moment was significantly less dramatic (probably due to the lack of a camera crew or team of editors looking to draw better ratings) and was easily solved, but I have to say, our marriage was tested that day. What was the problem, you ask? It was a door handle. A noticeably not-level door handle. To me, someone who had just spent the last week of her life working strenuously on painting the cabinets perfectly, the idea of having to plug yet another unwanted hole, sand it down, and then prime, paint, and seal all over again was just enough to make my voice do the shrill wife thing and my eyeballs come as close as possible to popping right out of their proper holes. But, good husband that I have, J sat me down in front of an episode of Elementary and set to work fixing it, no wood filler or repainting required. Crisis averted. This is where I felt like we hit true "new kitchen" status. The hardware made the kitchen look more finished (even though it wasn't) and really pulled everything together. I love our backsplash. I love it so much. But listen to me when I say DO NOT GET A GLASS TILE BACKSPLASH. DO. NOT. When we went to Floor & Decor to pick out our tile, we fell in love with the gray subway tile in a shower display. 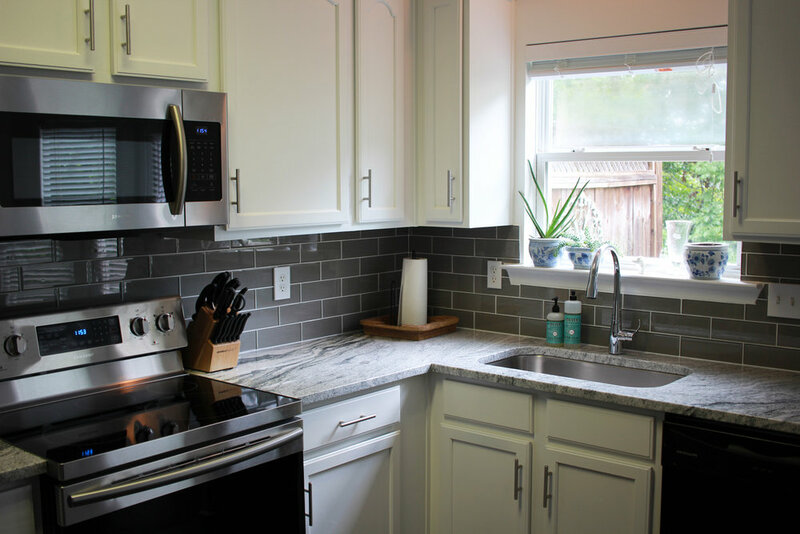 Neither of us originally wanted subway tile, but the gray color and shine from the glass made it stand out, and we liked how it brought together the white cabinets and the granite. When it came time to install, we headed to Floor & Decor to pick up the tiles, and a super helpful employee helped us make sure we got all the supplies we'd need (spoiler: it's more stuff than you think). We stopped at Home Depot to rent a wet saw and grab a few extra supplies, then headed home to get to work. Except not. Because the tiles were chipping and cracking like mad. Upon further googling, we discovered that you apparently cannot use the same saw blade for glass tile that you would for ceramic. Because of course. So, back to Home Depot for a diamond saw blade. You heard me. Diamond. After that, things went much more smoothly (no pun intended, but I like it). It was easier than I thought it'd be, especially with only this video for training. I actually rather enjoyed the work, although I had the much easier job of spreading mortar and laying tiles while J had the more high-stakes task of working the wet saw. 10 hours later, we had mortar in our hair! Oh, and a backsplash! And that was the end of the problems, right? Wrong again. Towards the end of the wall, we probably should have remixed the mortar, but we pushed through. And two days later, when we took out the spacers, there were a few casualties. RIP. Thankfully, none of the tile actually broke, so we didn't have to cut any new ones. But I DID have to spend the better part of an hour grinding the dried mortar off the wall and applying tile repair mortar. After that had a few hours to dry, it was grout time. I did this alone on my day off while J was at work, and it was a piece of cake. After that had a day to dry, I went back and caulked the seam where the tile meets the countertop, as well as all the "raw" edges (where the tile ends without meeting a wall). When it came time to put the outlet covers back on, I found a few tile cuts around the outlets that were a little imperfect, but easily fixed. We used outlet spacers for where the tile was cut a little too far away from the outlet, and a diamond file for where the tile covered up the screw hole for the outlet cover. While painting the cabinets wins the award for longest kitchen project, the backsplash was by far the most work. But, it's also the one we're proudest of, and I love that it's one we worked on together. We were originally going to wait a bit to replace appliances, but with all the times we were in Home Depot during this kitchen update, we noticed an amazing sale we couldn't pass up. Plus, both of us were sick to death of trying to clean the stupid coils on our old stove, and our microwave had been missing its plate since we moved in. Plus, something about shiny new stainless steel really makes this feel like a brand new space. I can't believe it's ours! And there you have it! There is nothing more satisfying than working hard and loving the results. Up next: light fixtures! Good design never sleeps..